EDIT - I've just been told that some people have a £5 off activewear voucher in their Sparks App so check it before you order! 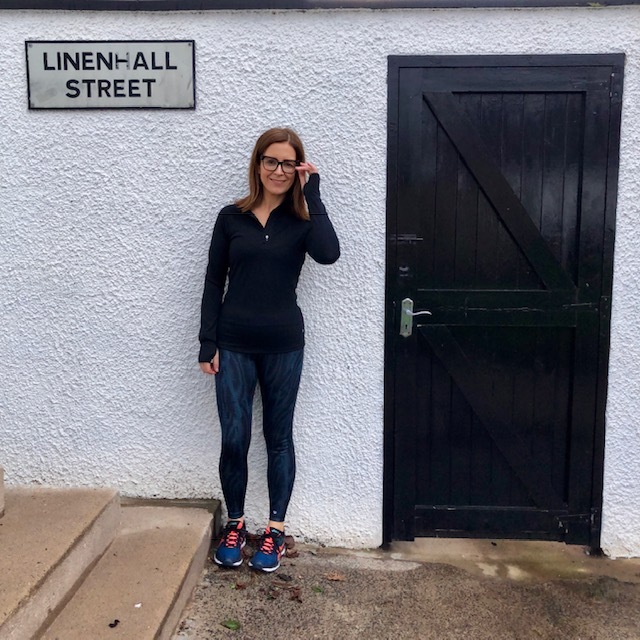 [AD - Affiliate Links] For my January collaboration with M&S, I'm a walking blogging cliche because I'm all about the activewear. I think most people have intentions of moving more this month and I'm one of them. Unfortunately, working life has impacted my gym visits - it's hard to fit everything in so my January aim is a hopefully achievable 1 weights & 1 pilates class per week. I'm also back running again, thanks to the running club at work. It's a lovely group of mixed ability runners and I've been out twice with them this month. 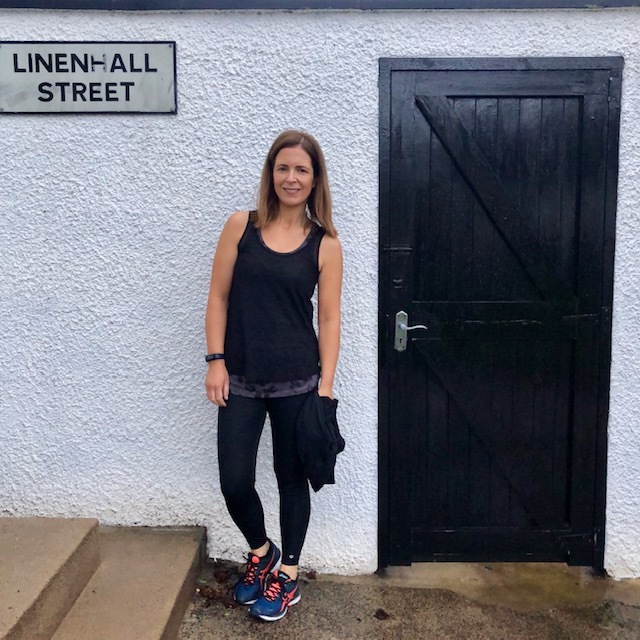 Great for keeping you going if you're like me and keep stopping along the way when out running on your own. But M&S active wear is, in my opinion, the best on the high street in terms of durability and design. I have a couple of pairs of their leggings from last year that I rotate weekly and they come out of the tumble drier just as good as new every time. So I based my new gym outfit around a pair of reversible leggings and what a revelation they were. They're plain black on one side - a lovely thick fabric too and not shiny so they're very flattering on the leg. On the other side, they have a subtle green/blue pattern (not as bright as the website) and most importantly it's not one of those patterns that changes or fades as your leg gets wider from the knee upwards. The only criticism is that they're not madly stretchy so aren't the best choice for something like yoga. However, the savvy amongst you will know that super stretchy leggings can be super clingy in all the wrong places. I'm always willing to trade stretch for decency. 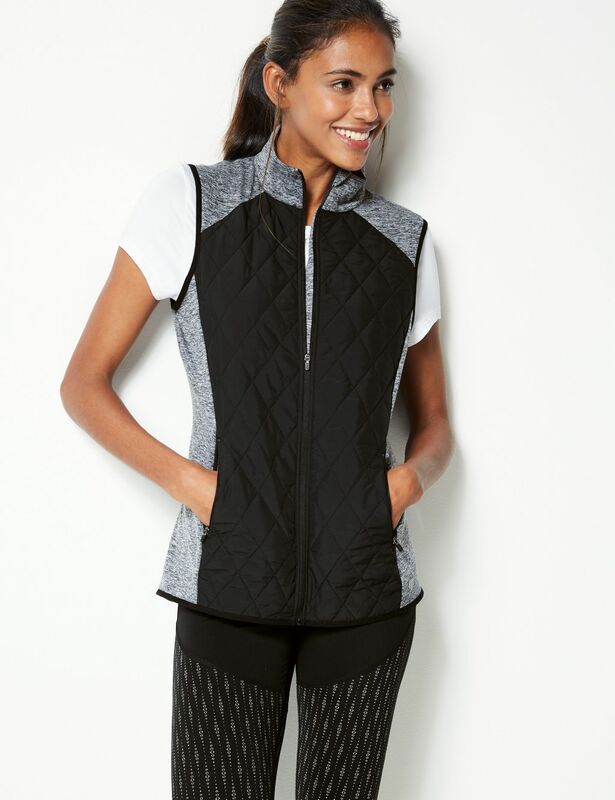 For running, I got this long sleeved half zip top, with the intention of wearing with the patterned side of the leggings. It's a lovely firm but stretchy fabric and has already washed and dried really well a couple of times. It's got runner thumb holes at the wrist and like the leggings, doesn't ride up but isn't clingy. I'm wearing the size 10 and it's perfect. This top is amazing for anyone with a long body and/or if you're conscious of your tummy. It's got a slightly tighter under vest - in a grey animal print - nice and long and it doesn't ride up. Then there's a sheer over vest that is not too see through and skims over your stomach and hips. I wore it to a pump class and to pilates and it was just lovely to wear. I'm going to order another one before they sell out. I'm wearing the size 10. Again, it's reversible - black on one side and coral pink on the other, with a mesh trim, which gives it a higher neckline. It's probably not great for bigger busted ladies and even for us less full in this area, it comes up small. I'm a 32 bust and I'm wearing the 12. The only disappointment in the order were the socks. I thought they would be thicker and more cushioned but they're not. Very thin and not what I was looking for. Luckily my daughters are size 4's and needed socks as I had already opened the pack and couldn't have returned them. 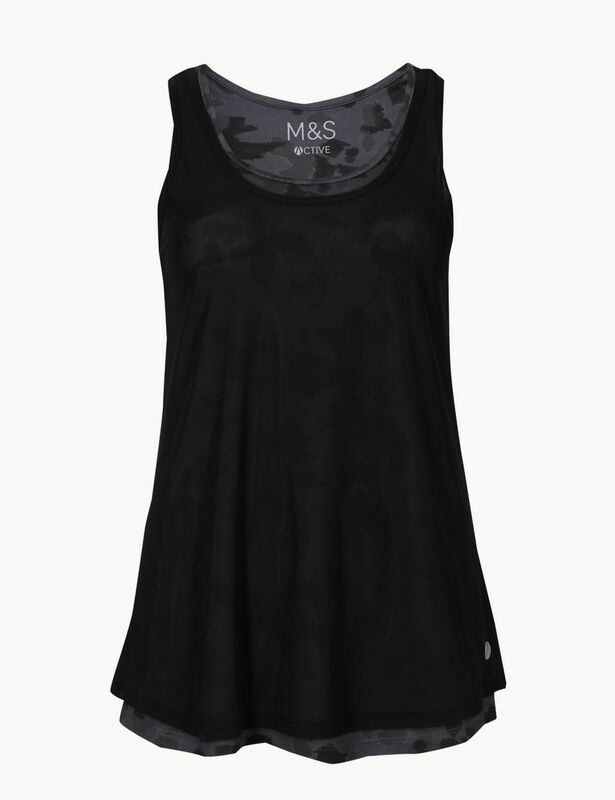 All told, another great collection of active wear from M&S this season. 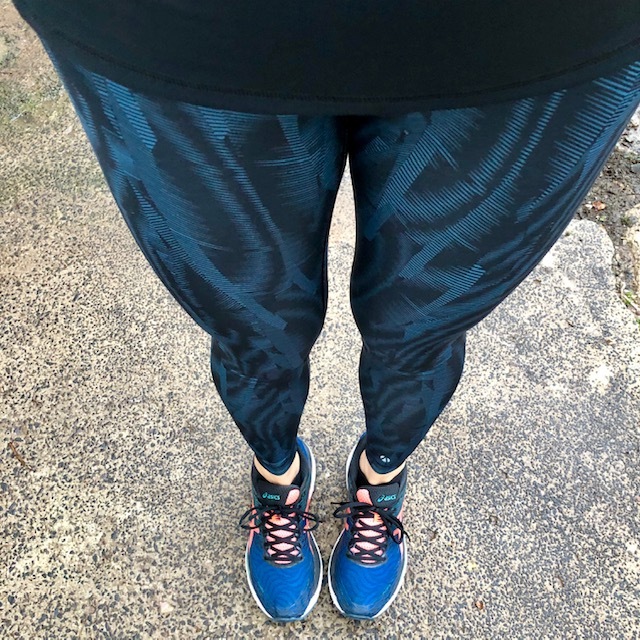 Here are a few other bits that were on the shortlist, starting with these leggings which I LOVE but which went out of stock just as I was about to check out. The reviews say to size up. I'm going to check in store tomorrow to see if I can get them as they match the double layer top perfectly. And this gilet is great for running in the colder weather...when you need pockets for gloves and your keys etc. Thanks to M&S as always for their constant support of the blog and for the opportunity to work on a more regular basis with them in 2019. I was gifted the items I reviewed and my links are affiliate links, which means that M&S know you came to their site from mine and they may pay me a tiny commission if you buy and keep something after clicking through. This doesn't change the price for you and the modest income I make from these links goes towards the upkeep of the blog.